Preheat the oven to 375°. In a food processor, combine 1 cup of the sliced almonds with the granulated sugar and process until powdery, about 2 minutes. Add the eggs, 2 tablespoons of the butter and the pure almond extract and process until creamy, about 2 minutes. With the food processor on, add the milk and process the custard mixture until blended. Transfer the custard mixture to a shallow baking dish. Spread the remaining 2 tablespoons of butter evenly on one side of each slice of brioche. Dip the unbuttered sides of the brioche into the custard and transfer to a baking sheet, custard side up. Spoon any remaining custard over the bread and sprinkle with the remaining 1/4 cup of sliced almonds. 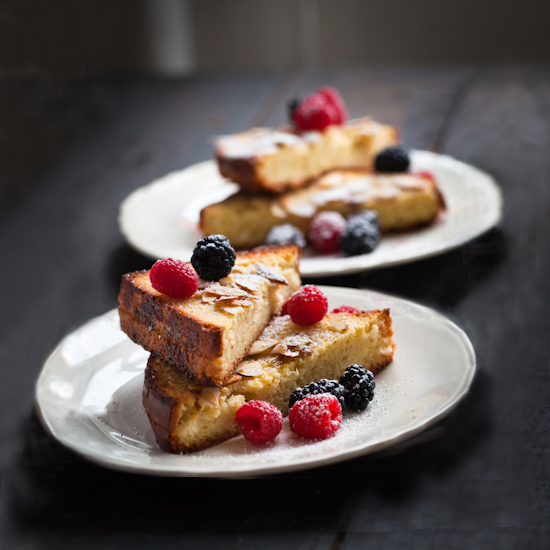 Bake the almond brioche for about 20 minutes, until the bottom is golden and crisp and the almonds are lightly browned. Transfer the brioche to plates and dust lightly with confectioners' sugar. Top with fresh berries and serve. Review Body: We will definitely be putting this into our "keeper" file, as it was perfect for us - I was making Easter brunch and wanted something like a homemade pastry, but I didn't have time to do a lot of baking. I got hooked in by "almond" and decided to make this even though the recipe sounded a lot like French toast. Well, it was nothing like French toast. It definitely was more pastry-ish and we were picking it up to eat. The custard was very thick and so, despite what the description claims, the brioche wasn't soaked in it. It was more like a thick layer over the top and dripping down the sides, which soaked in a little bit while it was cooking. It was absolutely DELICIOUS and everyone loved it!